A big sumptuous wine with a deep rich color and laden with ripe berries, cherry and a hint of some dried fruits. Beside the fruit aspect there is a wonderful cocoa and cinnamon spice nuance that play well together. A little bit of vanilla comes through along with a touch of tea and cola. The tannins and oak are well suited to the weight of the wine and aid in the overall balance and intensity. The wine has a nice bright aspect on the pallet that turns to a rich creamy finish. This wine will age very well. However, if you are like me and desire to age your wine in your stomach then at least decant and let the wine breath a couple hours. I am very happy with this wine! 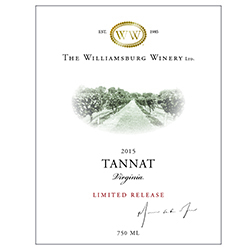 The Tannat was picked on 18 Sep at 23.1 brix, 3.54 pH and 6.74 TA. The Petit Verdot was picked on 02 October at 20.0 brix, 3.59 pH and 9.5 TA. The Tannat was cold soaked for 6 days then fermented in ½ ton macro bins for 7 days with VRB yeast. The Petit Verdot was cold soaked for 3 days then fermented in stainless steel for 6 days with D254 yeast. 25% New French oak, 12.5% New Hungarian oak, 25% 1 year French Oak, 12.5% 2 year French Oak, 25% 4 year French Oak.